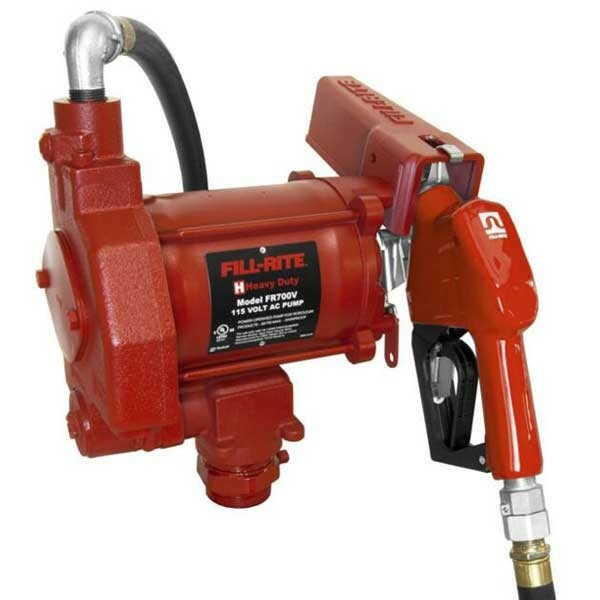 Fill-Rite BD700V 115-Volt AC complete transfer pump delivers up to 20 GPM (76 LPM). 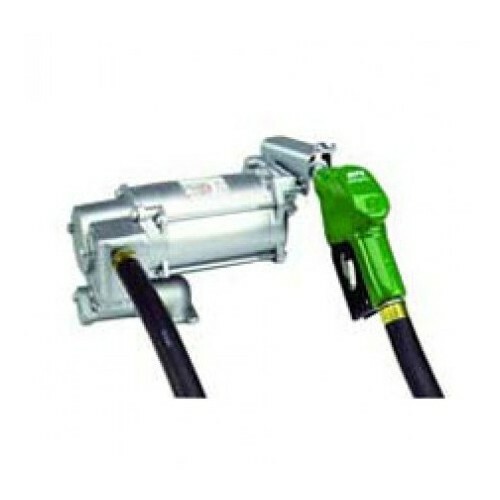 This 115 volt pump is designed for pumping biodiesel (B21 to B100). FR310VN 115 / 230 Volt Super High Flow AC transfer pump delivers up to 35 GPM (130 LPM). This diesel pump is designed for pumping diesel fuel only. Pump only. 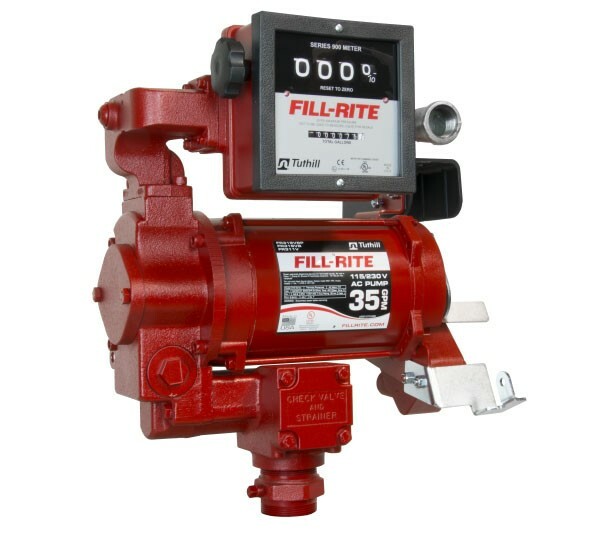 Fill-Rite FR311VN 115 / 230 Volt Super High Flow AC transfer pump with meter delivers up to 30 GPM (113.55 LPM). 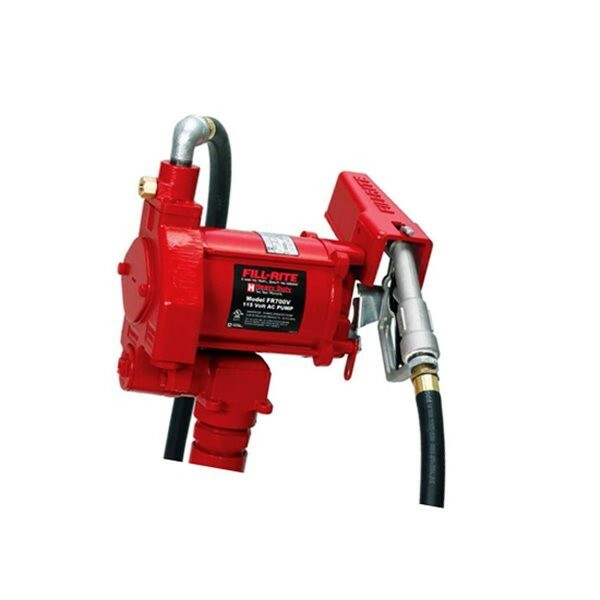 This 115 volt transfer pump is designed for pumping diesel fuel only. Pump and Meter only. 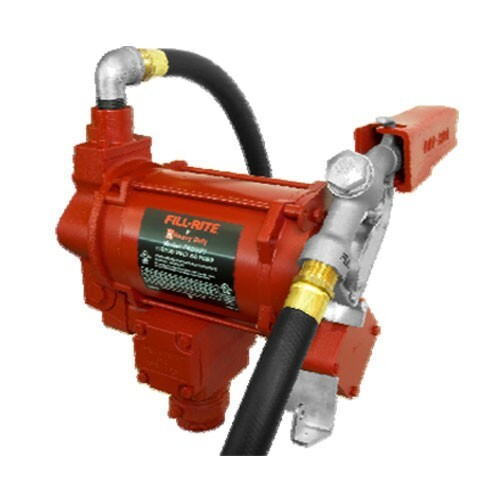 Fill-Rite FR319VBPC 115/230 Volt High Flow AC Diesel transfer pump with 900DP meter with pulser and safe barrier delivers up to 33 GPM (125 LPM). 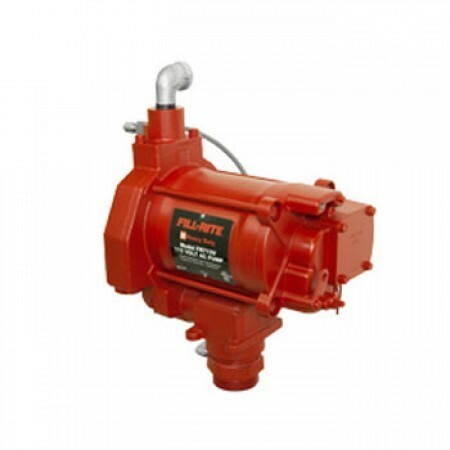 This 115V transfer pump is designed especially for use with fuel management systems. 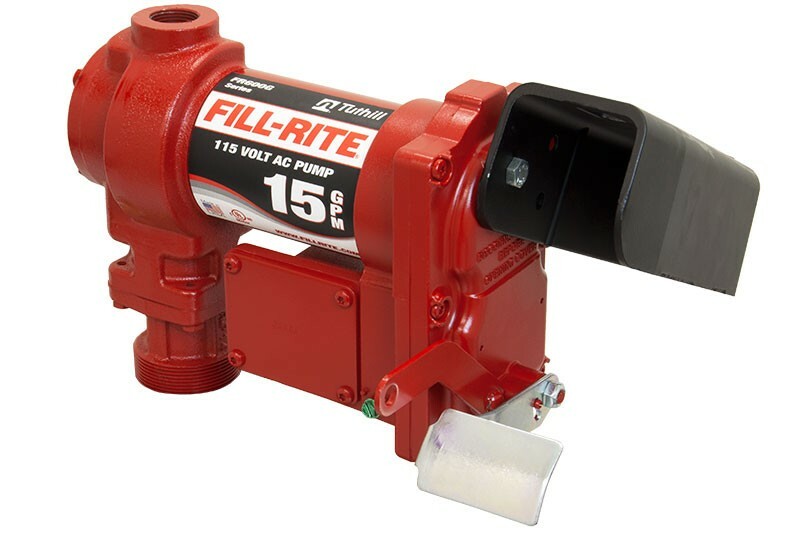 Fill Rite-FR610G 115-Volt AC transfer pump delivers up to 15 GPM (57 LPM). 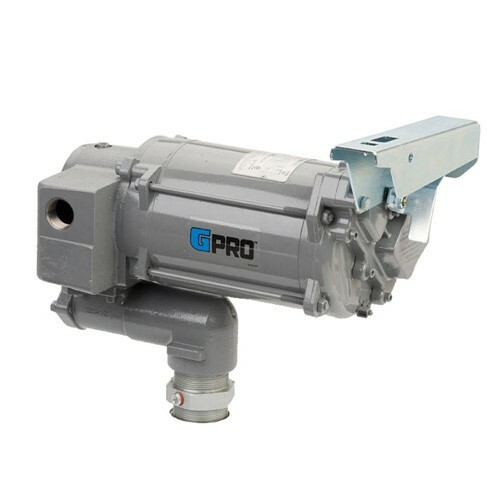 FR610G transfer pump is designed for pumping gasoline and diesel fuel. Comes with 3/4" manual nozzle and 3/4" x 12' hose. 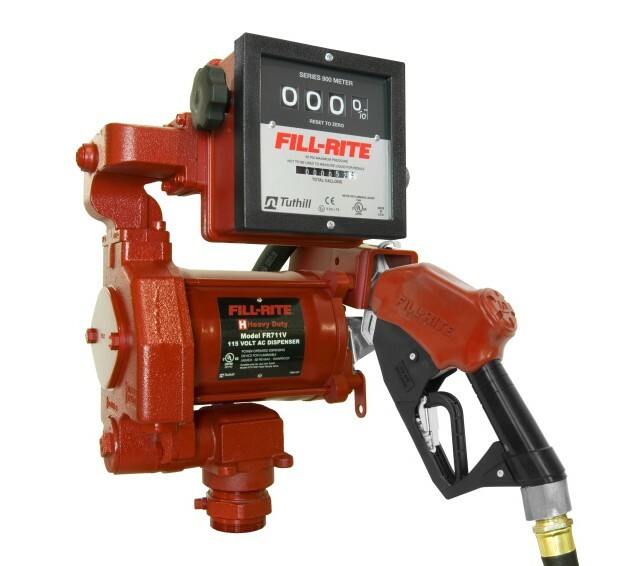 Fill-Rite FR700V 115-Volt AC transfer pump with meter delivers up to 20 GPM (76 LPM). Designed for pumping gas, diesel fuel and kerosene. 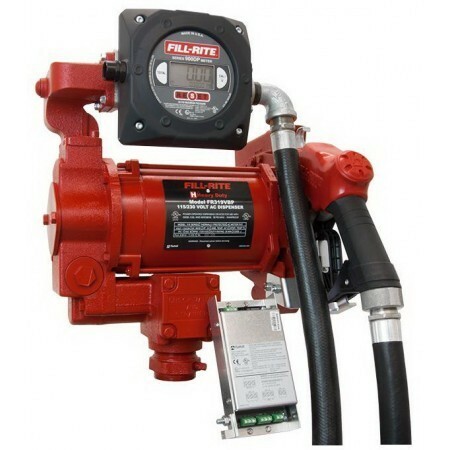 Fill-Rite FR701V 115-Volt AC transfer pump with meter delivers up to 17 GPM (64.3 LPM). FR701V is designed for pumping gas, diesel fuel and kerosene. Fill-Rite SD602G 115-Volt AC complete transfer pump delivers up to 13 GPM (49 LPM). Designed for tank or barrel mounting. Comes with 3/4" manual nozzle and 3/4" x 12' hose. Simer 90100 115 Volt AC Bulldog Transfer Pump with explosion proof motor delivers up to 28 GPM (106 LPM). Simer 90100 115 volt pump is for use with chemical and fluid. 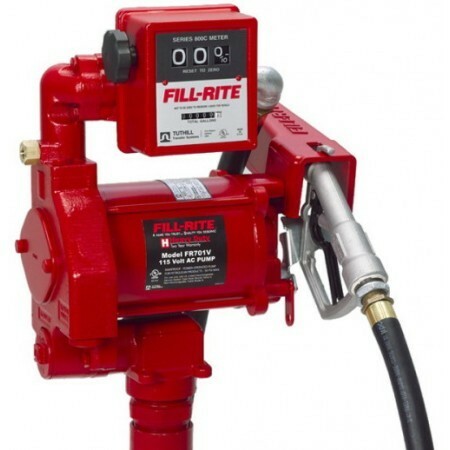 Fill-Rite FR300VN 115/230 Volt High Flow AC transfer pump delivers up to 20 GPM (76 LPM). 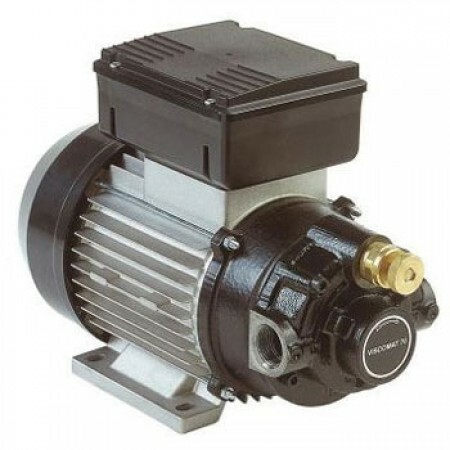 This rotary vane pump is designed for pumping diesel, gasoline, bio-diesal up to B20, E15, kerosene. Pump only. Fill-Rite FR311VLN 115 / 230 Volt Super High Flow AC transfer pump with 901L meter delivers up to 30 GPM (113.55 LPM). 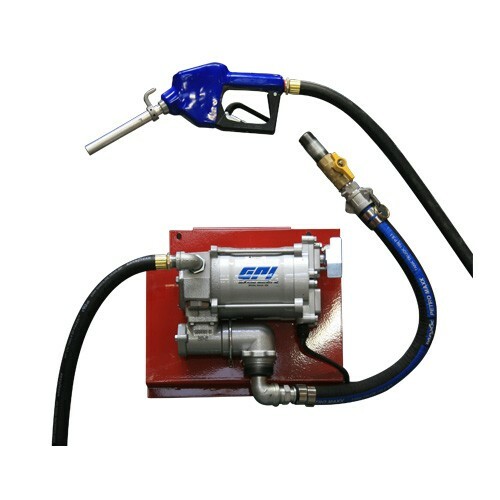 This 115 volt transfer pump is designed for pumping diesel, gasoline, bio-Diesel up to B20, E15, kerosene. Pump and Meter Only. Fill-Rite FR700VA 115-Volt AC transfer pump delivers up to 20 GPM (76 LPM). Designed for pumping gas, diesel fuel and kerosene. Comes with automatic nozzle. 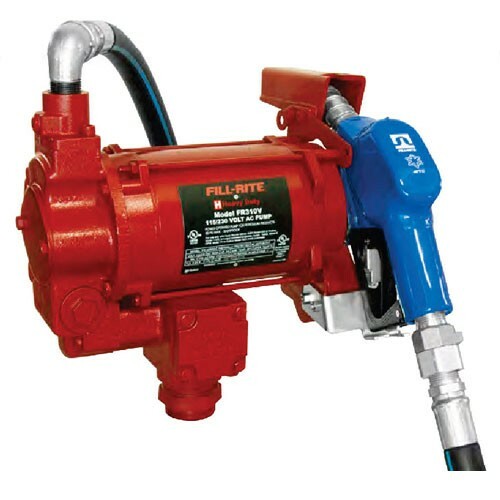 Fill-Rite FR700VN 115-Volt AC transfer pump (pump only) delivers up to 20 GPM (76 LPM). Designed for pumping gas, diesel fuel and kerosene. Easy removable strainer, automatic bypass valve, 2" threaded bung for tank openings. Fill-Rite FR701VL 115-Volt AC transfer pump with 807CL meter delivers up to 20 GPM (76 LPM). FR701VL is designed for pumping gas, diesel fuel and kerosene. Comes with 807CL mechanical meter. 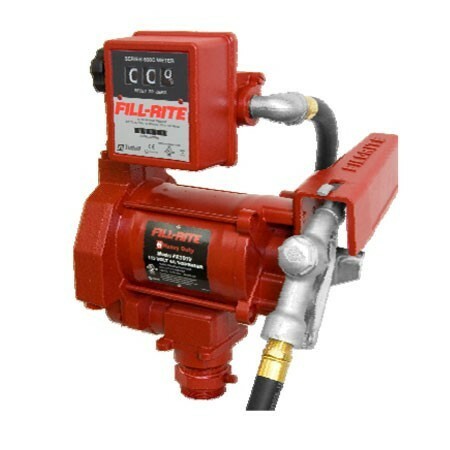 Fill-Rite FR701VA 115-Volt AC transfer pump delivers up to 20 GPM (76 LPM). Come with 807C mechanical meter and automatic nozzle. 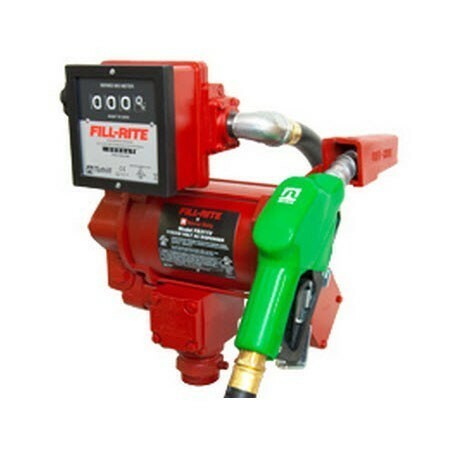 Fill-Rite FR710VN 115-Volt AC transfer pump (pump only) delivers up to 23 GPM. With 1" outlet for higher flow rate. Designed for pumping gas, diesel fuel and kerosene. Fill-Rite FR711VA 115-Volt AC high flow transfer pump delivers up to 23 GPM. Comes with 901 mechanical meter and 1" high flow automatic nozzle. 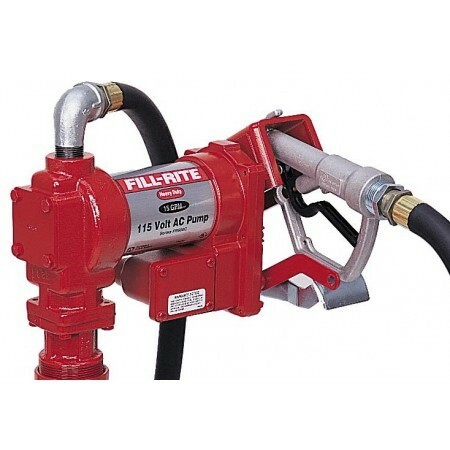 Fill-Rite FR711VLAC 115-Volt AC high flow pump comes with 901L meter and 1" hi flow automatic nozzle delivers up to 23 GPM. 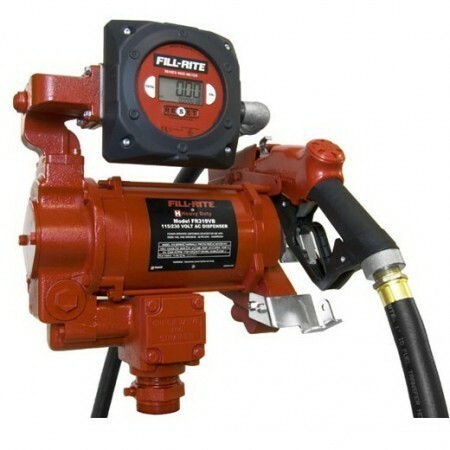 Fill-Rite FR713V 115-Volt AC transfer pump delivers up to 18 GPM (68 LPM). Designed for use with AST remote dispensers. Fill Rite FR604GE 115-Volt AC transfer pump delivers up to 15 GPM (57 LPM). For pumping gasoline and diesel fuel. Fill Rite-FR610GA 115-Volt AC transfer pump delivers up to 15 GPM (57 LPM). With 1/4 HP motor, FR610GA is designed for pumping gasoline and diesel fuel. Comes with automatic nozzle. 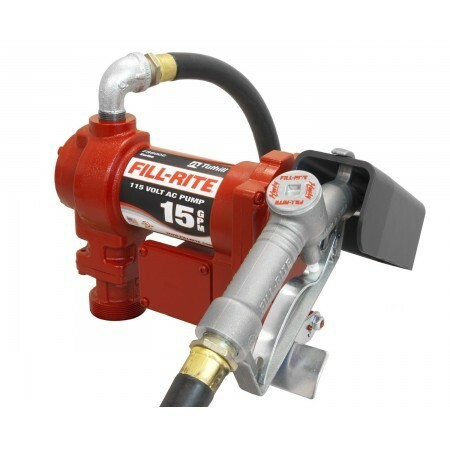 Fill Rite FR604G 115-Volt AC transfer pump delivers up to 15 GPM (57 LPM). Used for pumping gasoline, kerosene and diesel fuel. Fill-Rite FR700VARC 115-Volt AC Arctic transfer pump delivers up to 20 GPM (76 LPM). Comes with Arctic Automatic Nozzle and Arctic Swivel. Perfect for static applications in very cold climates. FR310VARC 115 / 230V AC arctic transfer pump delivers up to 35 GPM (132 LPM). Comes with 1" Arctic automatic nozzle and Arctic swivel, Arctic hose. Ideal for used in coldest temperatures. Fill-Rite FR311VB 115/230-Volt AC high flow transfer pump delivers up to 30 GPM (113 LPM). Comes with 901 Meter, 1"x12' Hose and 1" Ultra High Flow Nozzle. Fill-Rite FR311VLB 115/230-Volt AC high flow transfer pump delivers up to 113 LPM (30 GPM). Comes with 901L Meter, 1"x12' Hose and 1" Ultra High Flow Nozzle. 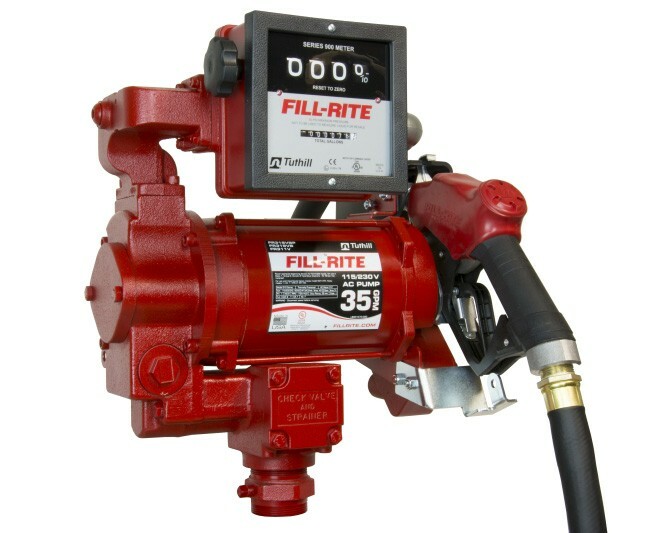 Fill-Rite FR319VB 115/230 Volt High Flow AC Diesel transfer pump with meter delivers up to 33 GPM (125 LPM). 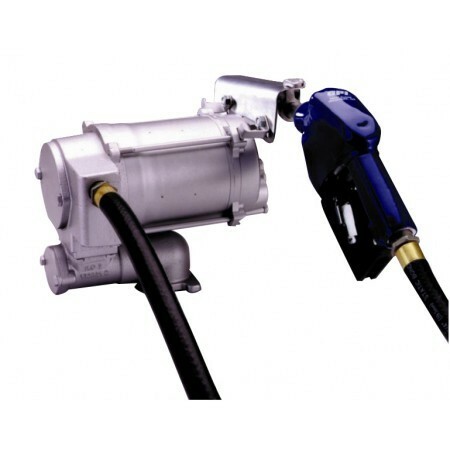 This 115volt transfer pump is designed for pumping diesel and biodiesel. 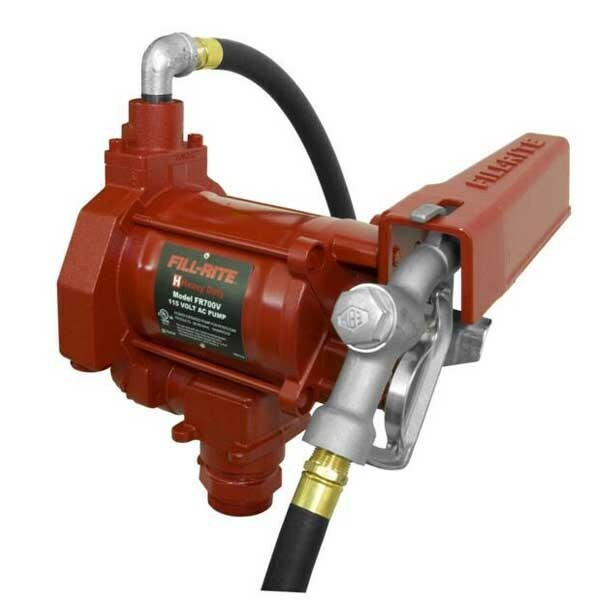 Fill-Rite FR701VLAC 115-Volt AC transfer pump with 807CL meter delivers up to 20 GPM (76 LPM). FR701VLAC is designed for pumping gas, diesel fuel and kerosene. Comes with 807CL meter, automatic nozzle and 3/4" x12' hose. Fill-Rite FR710VBC 115-Volt AC transfer pump delivers up to 23 GPM (87 LPM). 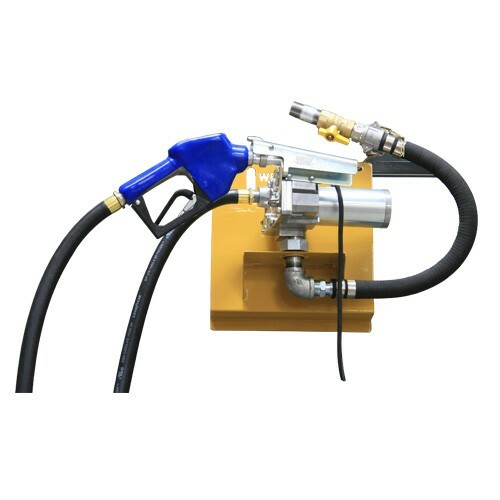 FR710VBC is designed for pumping gas, diesel fuel and kerosene. 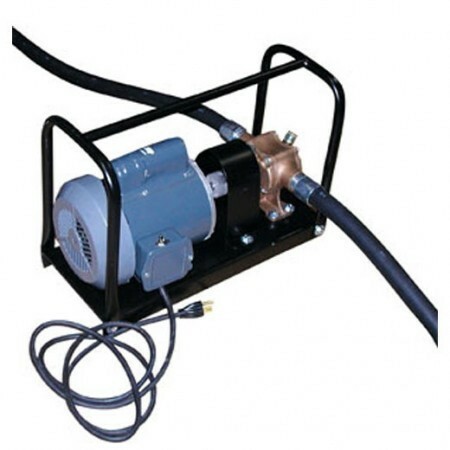 Comes with 1"x18' Hose & 1" Ultra Hi-Flow Automatic Nozzle. FR310VBC 115/230 Volt Super High Flow AC transfer pump delivers up to 35 GPM (130 LPM). This diesel pump is designed for pumping diesel fuel only. Comes with 1" x 18' Hose, Ultra Hi-Flow Nozzle. Fill-Rite FR311VLBC 115/230 Volt AC high flow transfer pump delivers up to 113 LPM (30 GPM). Comes with 901L Meter, 1"x18' Hose and 1" Ultra High Flow Nozzle. 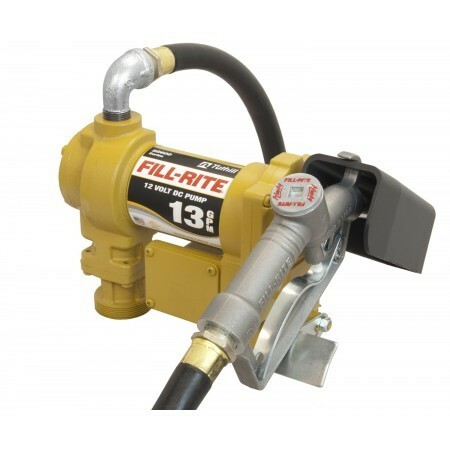 Fill-Rite FR319VBC 115/230 Volt High Flow AC Diesel transfer pump with meter delivers up to 33 GPM (125 LPM). 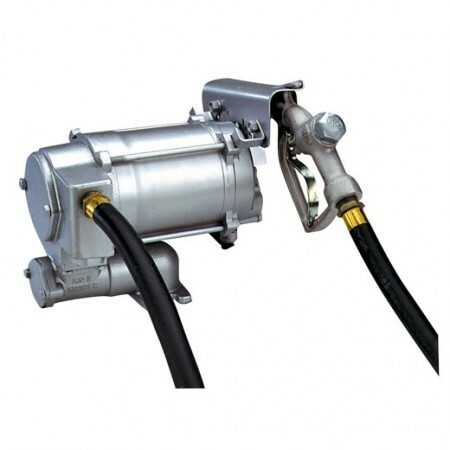 This 115 volt transfer pump is designed for pumping diesel and biodiesel. Comes with 900DB meter, ultra hi-flow nozzle and 1" x 18' hose. 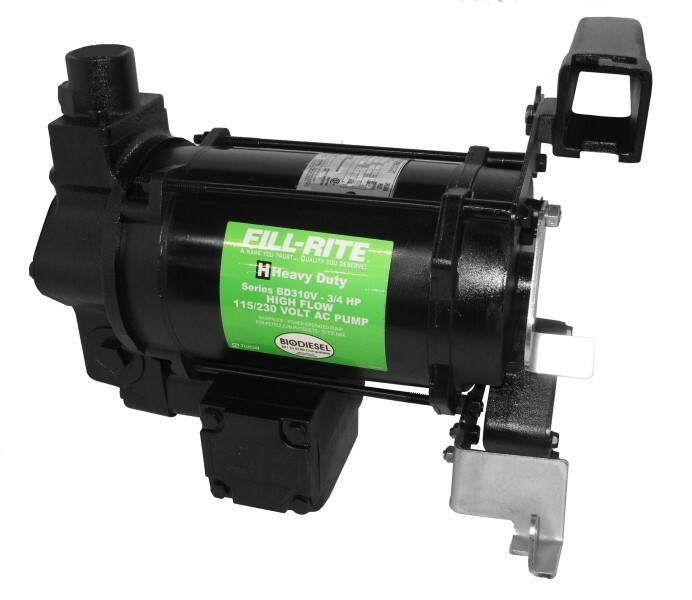 Fill-Rite BD310VN 115/230 Volt AC complete transfer pump (pump only) delivers up to 35 GPM (131 LPM). This 115 volt is designed for pumping bio-diesel (B21 to B100). 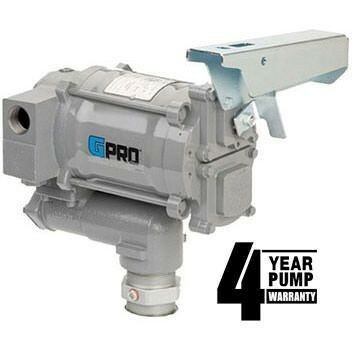 GPI PRO35-115PO 115/230 Volt GPRO High-Flow Fuel Transfer Pump (Pump Only) delivers fuel up to 35 GPM (132 LPM). For use with Gasoline (up to E-15), diesel fuel (up to B20) and kerosene. 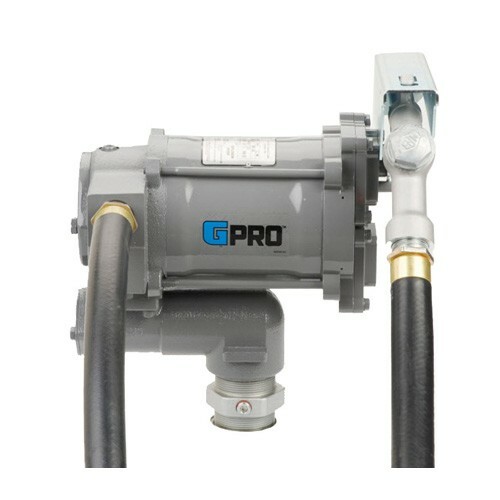 The GPI PRO35-115MD 115/230 Volt GPRO High-Flow Fuel Transfer Pump delivers fuel up to 35 GPM (132 LPM). Recommended use with Gasoline (up to E-15), diesel fuel (up to B20) and kerosene. Comes with a manual nozzle and hose. 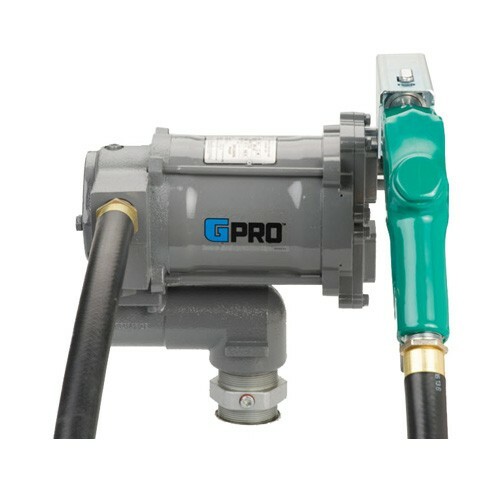 The GPI PRO35-115AD 115/230 Volt GPRO High-Flow Fuel Transfer Pump delivers fuel up to 35 GPM (132 LPM). Recommended use with Gasoline (up to E-15), diesel fuel (up to B20) and kerosene. Comes with an automatic nozzle and hose. GPI PRO35-115PO/XTS 115/230 Volt GPRO Extreme Temperature High-Flow Fuel Transfer Pump (Pump Only) delivers fuel up to 35 GPM (132 LPM). For use with Gasoline (up to E-15), diesel fuel (up to B20) and kerosene.Temperature Rating is low to -40 °F (-40°C). The GPI PRO35-115AD/XTS 115/230 Volt GPRO Extreme Temperature High-Flow Fuel Transfer Pump delivers fuel up to 35 GPM (132 LPM). Recommended use with Gasoline (up to E-15), diesel fuel (up to B20) and kerosene. Comes with an automatic nozzle and hose. Temperature is low to -40 °F (-40°C). GPI PRO20-115PO 115 Volt GPRO High-Flow Fuel Transfer Pump (Pump Only) delivers fuel up to 20 GPM (76 LPM). For use in industrial applications, fleet and agriculture. 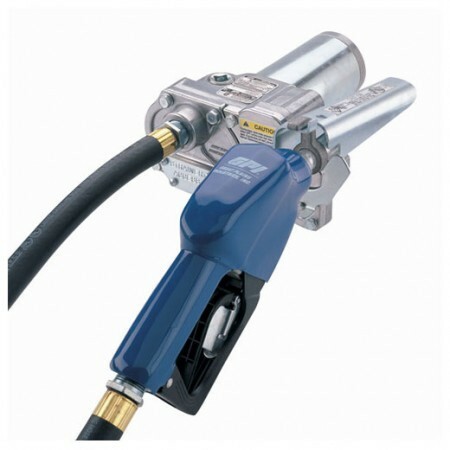 The GPI PRO20-115MD 115/230 Volt GPRO High-flow Fuel Transfer Pump delivers fuel up to 20 GPM (76 LPM). Recommended use with gasoline (up to E-15), diesel fuel (up to B20) and kerosene. Comes with a manual nozzle and hose. 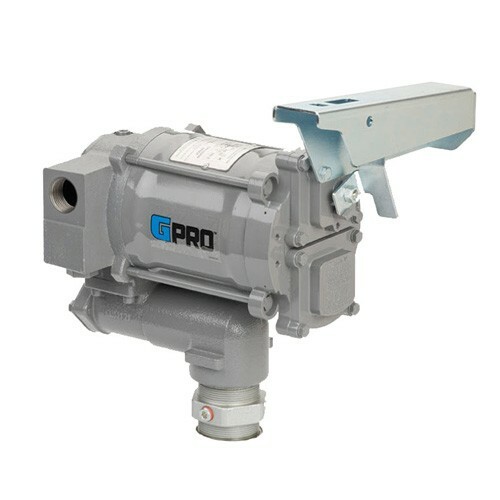 The GPI PRO20-115AD 115 Volt GPRO High-Flow Fuel Transfer Pump delivers fuel up to 20 GPM (76 LPM). Recommended use with gasoline (up to E-15), diesel fuel (up to B20) and kerosene. Comes with an automatic nozzle and hose. GPI PRO20-115PO/XTS 115 Volt High-flow Fuel Transfer Pump (Pump Only) delivers fuel up to 20 GPM (76 LPM). This extreme temperature pump series is for use with gasoline (up to E-15), diesel fuel (up to B20) and kerosene. Temperature Rating is low to -40 °F (-40°C). The GPI PRO20-115AD/XTS 115 Volt GPRO Extreme Temperature High-Flow Fuel Transfer Pump delivers fuel up to 20 GPM (76 LPM). Recommended use with Gasoline (up to E-15), diesel fuel (up to B20) and kerosene. Comes with an automatic nozzle. Temperature is low to -40 °F (-40°C). Western Global PKT11.12 is a 115 Volt AC Transfer Pump kit with mounting kit , 3/4" inlet fittings, 12' x 3/4" hose, auto nozzle. Delivers up to 12 GPM. 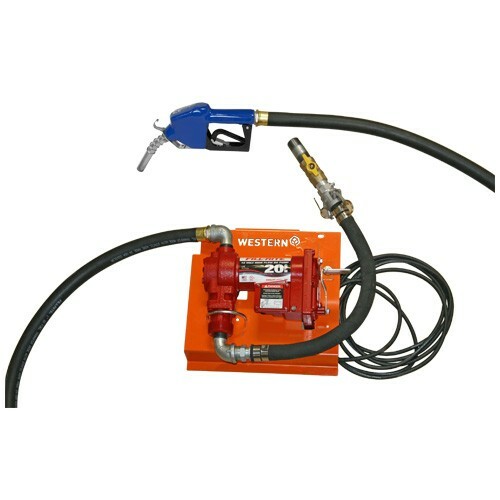 Western Global PKT11.20 is a 115 Volt AC Transfer Pump kit with mounting kit , 3/4" inlet fittings, 12' x 3/4" hose, auto nozzle. Delivers up to 20 GPM. Western Global PKT11.30 is a 115/230 Volt AC Transfer Pump kit with mounting kit , 1" inlet fittings, 12' x 1" hose, auto nozzle. Delivers up to 30 GPM. Western Global PKT11.15-FR is a Fill-Rite 115 Volt AC Transfer Pump kit with mounting kit , 3/4" inlet fittings, 12' x 3/4" hose, auto nozzle. Delivers up to 15 GPM. 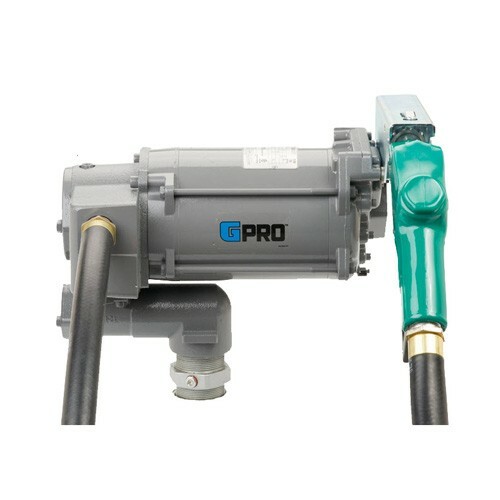 The PRO20-115RD 115 Volt GPRO High-Flow Fuel Transfer Pump used for remote dispensing systems. Delivers fuel up to 20 GPM (76 LPM). Recommended use with gasoline (up to E-15), diesel fuel (up to B20) and kerosene. 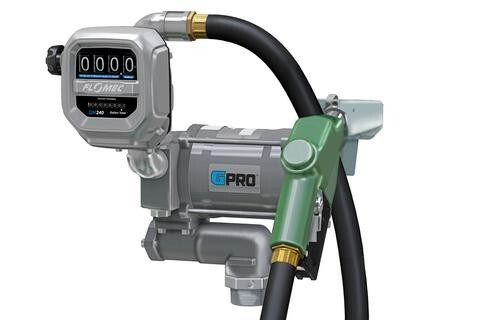 GPI PRO20-115PO/QM240G8N 115 Volt GPRO High-Flow Fuel Transfer Pump and Meter delivers fuel up to 20 GPM (76 LPM). Designed for Stationary Tank Applications where high flow and long life are desired. The GPI PRO20-115AD/QM240G8N 115 Volt GPRO Fuel Transfer Pump w/ Auto Diesel Nozzle & Meter delivers fuel up to 20 GPM (76 LPM). Recommended use with gasoline (up to E-15), diesel fuel (up to B20) and kerosene. Comes with an automatic nozzle and hose. 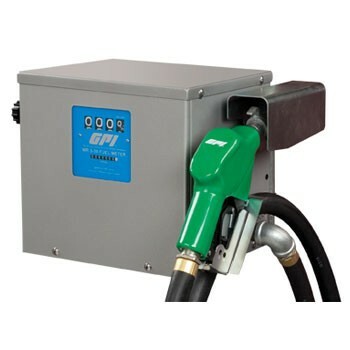 GPI PRO20-115PO/QM150L8N 115 Volt GPRO High-Flow Fuel Transfer Pump and Meter delivers fuel up to 76 LPM (20 GPM). Designed for Stationary Tank Applications where high flow and long life are desired. The GPI PRO20-PRO20-115AD/QM150L8N 115 Volt GPRO Fuel Transfer Pump w/ Auto Diesel Nozzle & Meter delivers fuel up to 20 GPM (76 LPM). Recommended use with gasoline (up to E-15), diesel fuel (up to B20) and kerosene. Comes with an automatic nozzle and hose. 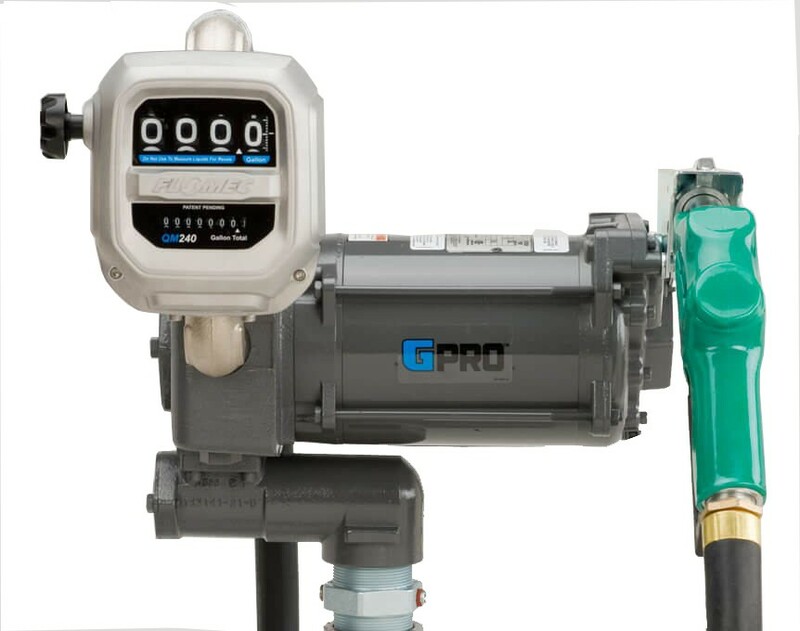 GPI PRO35-115AD/QM240G8N 115 Volt GPRO High-Flow Fuel Transfer Pump and Meter delivers fuel up to 35 GPM (132 LPM). Designed for Stationary Tank Applications where high flow and long life are desired. 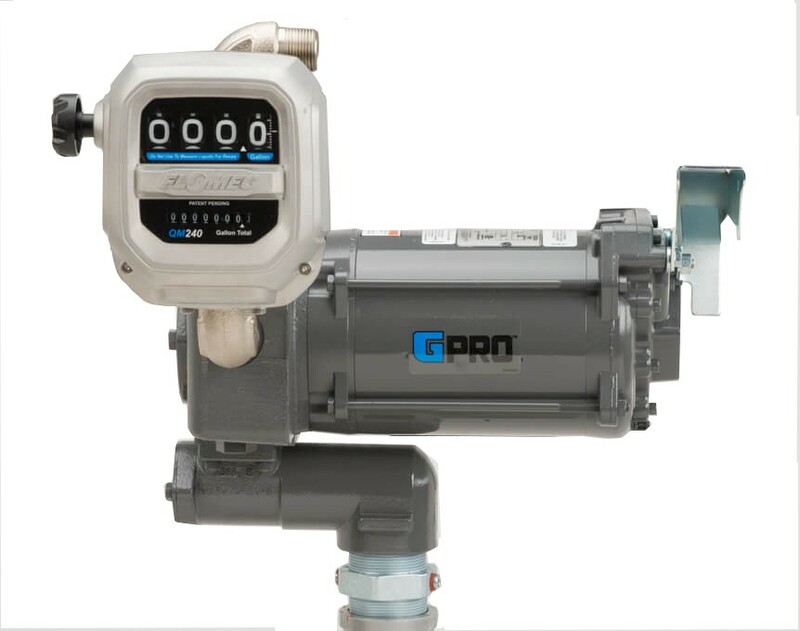 GPI PRO35-115PO/QM240G8N 115 Volt GPRO High-Flow Fuel Transfer Pump and Meter delivers fuel up to 35 GPM (132 LPM). Designed for Stationary Tank Applications where high flow and long life are desired. 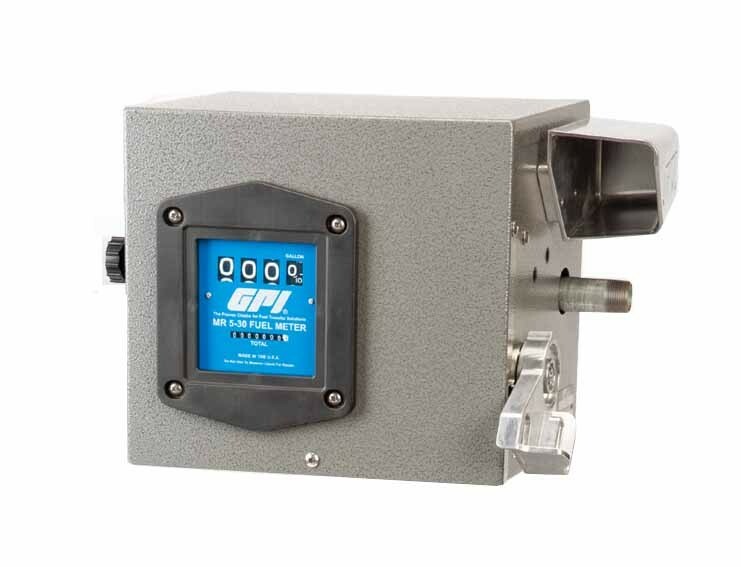 GPI PRO35-115PO/QM150L8N 115 Volt GPRO High-Flow Fuel Transfer Pump and Meter delivers fuel up to 35 GPM (132 LPM). Designed for Stationary Tank Applications where high flow and long life are desired. 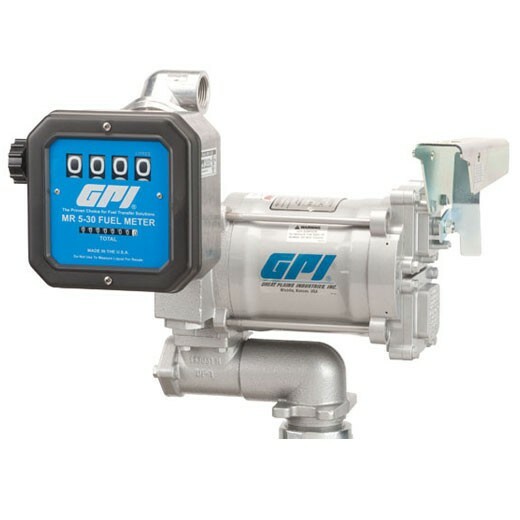 GPI PRO35-115AD/QM150L8N 115 Volt GPRO High-Flow Fuel Transfer Pump and Meter delivers fuel up to 35 GPM (132 LPM). Designed for Stationary Tank Applications where high flow and long life are desired. 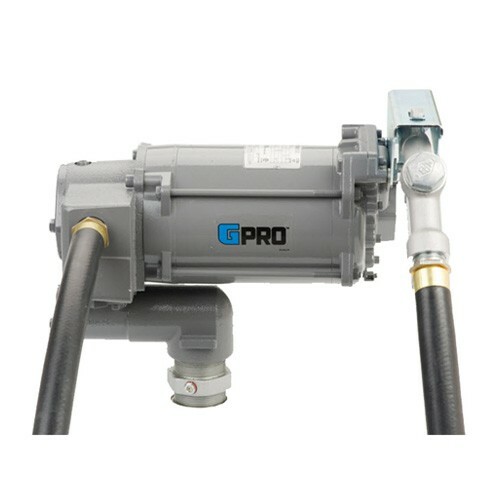 The PRO35-115RD 115 Volt GPRO High-Flow Fuel Transfer Pump used for remote dispensing systems. Delivers fuel up to 35 GPM (132 LPM). For use with gasoline (up to E-15), diesel fuel (up to B20) and kerosene. 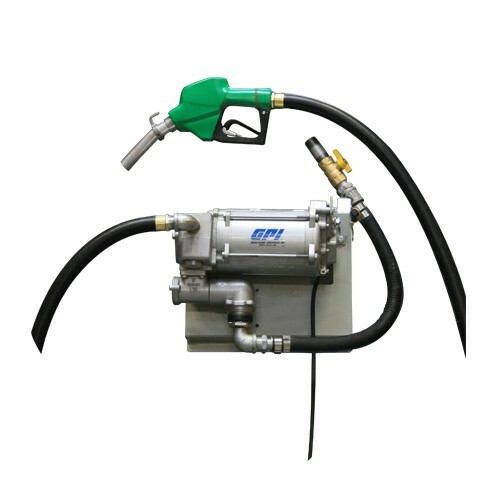 GPI M-3120-PO 133200-07 is a 115 Volt AC Heavy Duty Vane Fuel Transfer Pump. Delivers up to 20 GPM (76 LPM). Pump and motor are UL Listed to U.S. and Canadian safety standards. 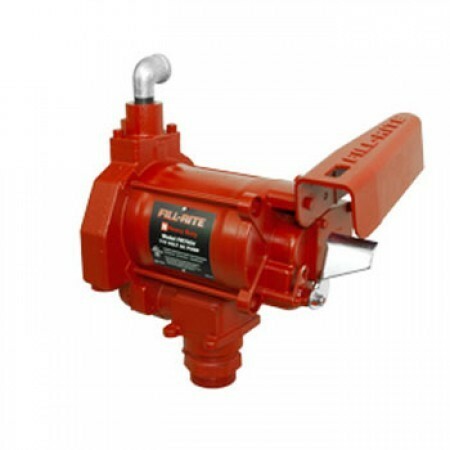 GPI M-3120-PO XTS 133200-97 is a 115 Volt AC Heavy Duty Vane Fuel Transfer Pump. Delivers up to 20 GPM (76 LPM).This Extreme Temperature Series (XTS) model is used for Cold weather. 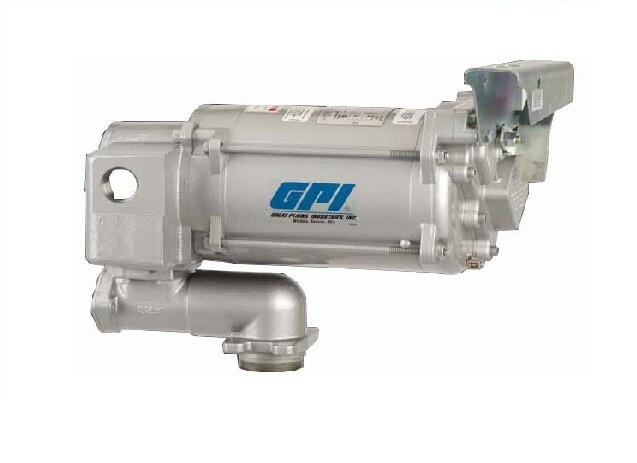 GPI M-3120-AD 133200-33 is a 115 Volt AC Heavy Duty Vane Fuel Transfer Pump. Delivers up to 20 GPM (76 LPM). Comes with an auto nozzle & hose. GPI CM-3120 143620-01 is a 115 Volt Carbon Vane Cabinet Fuel System. Includes the M-3120 Pump, up to 20 GPM, with a 1 in. NPT hose connection. Mechanical Meter is calibrated in gallons. Includes tank adapter. Order hose and nozzle separately. GPI CM-3120 143620-02 is a 115 Volt Carbon Vane Cabinet Fuel System. Includes the M-3120 Pump, up to 76 LPM, with a 1 in. NPT hose connection. Mechanical Meter is calibrated in liters. Includes tank adapter. Order hose and nozzle separately. GPI M-3120-AD/ MR 5-30-G8N 133600-35 115 Volt AC Heavy Duty Fuel Pumps and Meter Combo is calibrated gallons with 1 in outlet. Delivers up to 20 GPM (76 LPM). Comes with an auto nozzle & hose. GPI M-3120-AD/ MR 5-30-L8N 133600-36 115 Volt AC Heavy Duty Fuel Pumps and Meter Combo is calibrated litre with 1 in outlet. Delivers up to 20 GPM (76 LPM). Comes with an auto nozzle & hose. GPI M-3120-ML/ MR 5-30-G8N 133600-37 115 Volt AC Heavy Duty Fuel Pumps and Meter Combo is calibrated gallons with 1 in outlet. Delivers up to 20 GPM (76 LPM). Comes with an manual nozzle & hose. 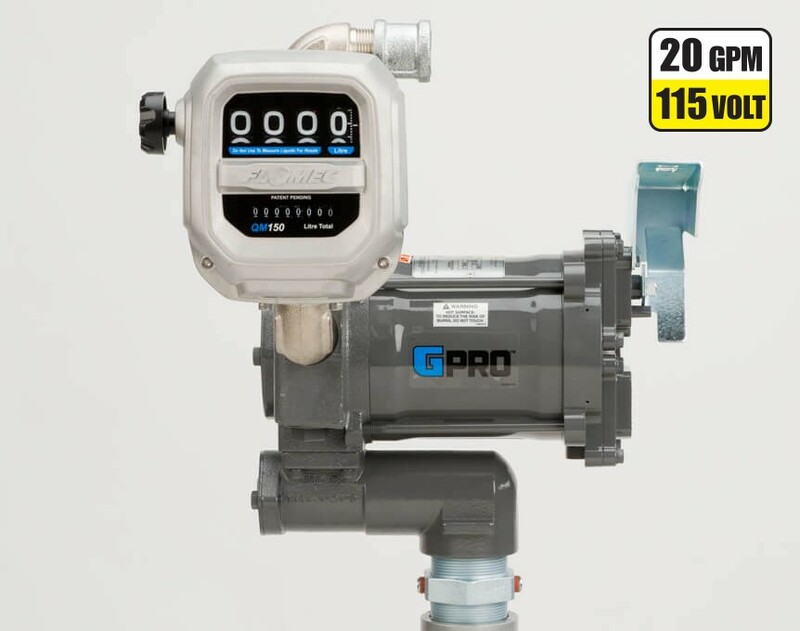 GPI M-3120-ML/ MR 5-30-L8N 133600-38 115 Volt AC Heavy Duty Fuel Pumps and Meter Combo is calibrated liters with 1 in outlet. Delivers up to 20 GPM (76 LPM). Comes with an manual nozzle & hose. GPI M-3120-ML/ MR 5-30-G6N 133600-58 115 Volt AC Heavy Duty Fuel Pumps and Meter Combo is calibrated gallons with 1 in outlet. Delivers up to 20 GPM (76 LPM). Comes with an manual nozzle & hose. 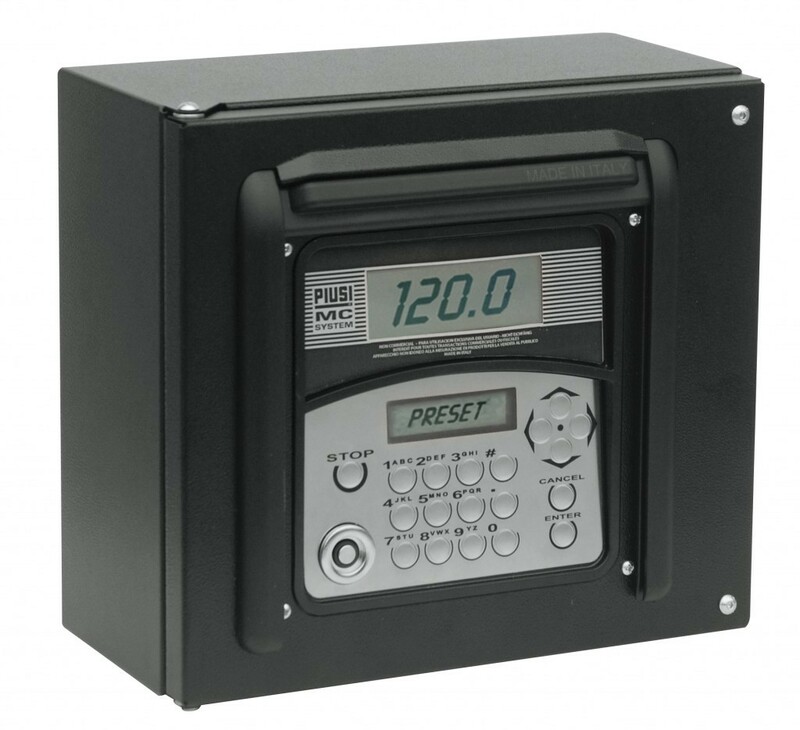 GPI M-3120-AL/ MR 5-30-G6N 133600-58 115 Volt AC Heavy Duty Fuel Pumps and Meter Combo is calibrated gallons with 1 in outlet. Delivers up to 20 GPM (76 LPM). Comes with an auto nozzle & hose.